We are commanded not to hate Egypt, but never to forget Amalek. Why the difference? The simplest answer is to recall the rabbis’ statement in The Ethics of the Fathers [5:16]: "If love depends on a specific cause, when the cause ends, so does the love. If love does not depend on a specific cause, then it never ends." The same applies to hate. When hate depends on a specific cause, it ends once the cause disappears. Causeless, baseless hate lasts forever. That is why are commanded to remember and never forget Amalek, not because the historic people still exists, but because a society of rational actors can sometimes believe that the world is full of rational actors with whom one can negotiate peace. It is not always so. When people hate you for a reason you can address this reason. You can argue, discuss facts, make them understand your point of view, understand theirs, modify circumstances and behaviours, find a compromise, and generally negotiate and come to a solution. In the Torah, these are the Egyptians [maybe not every one of them, but the leaders]. When people just hate you and afterwards come up with reasons for it, there is nothing you can do. If you remove the reason for their hate, they will just find another reason. That is Amalek, they had no dealings with the Israelite and still attacked them. There’s no point in trying to resolve the conflict as there is no reason for it. The challenge is to see when it’s one or the other and concentrate your energy on those people that have valid reasons for their hate and try to arrive at a common ground. […] We, the semikhah and yeshiva students, were davenning the morning service in one of the lounges in the chateau when the Reform woman entered, wearing tallit and tefillin, and sat herself down in the middle of the group. This is something the students had not encountered before. What were they to do? There was no mechitzah. There was no way of separating themselves. How should they react to a woman wearing tallit and tefillin and praying in the midst of a group of men? They ran up to the Rav in a state of great agitation and asked what they should do. Without a moment’s hesitation he quoted to them the saying of the sages: A person should be willing to throw himself into a furnace of fire rather than shame another person in public. Because Mar Zutra b. Tobiah said in the name of Rab (others state: R. Huna40 b. Bizna said in the name of R. Simeon the Pious; and others again state: R. Johanan said in the name of R. Simeon b. Yohai): Better had a man thrown himself into a fiery furnace than publicly put his neighbour to shame. Whence do we derive this? From [the action of] Tamar; for it is written in Scripture, When she was brought forth, [she sent to her father-in-law]. R. Zutra b. Tobiah further said in the name of Rab — according to others. R. Hanah b. Bizna said it in the name of R. Simeon the Pious, and according to others again. R. Johanan said it in the name of R. Simeon b Yohai: It is better for a man that he should cast himself into a fiery furnace rather than that he should put his fellow to shame in public.13 Whence do we know this? From Tamar, of whom it says, When she was brought forth etc. A corollary from the Sinai mass revelation discussion. Another argument for the uniqueness (and by implication divinity) of the Torah that I have heard a few times is that the leading figures in Torah are all imperfect. The Torah describes all their sins very openly. Other (men-written) texts from the time glorify their leaders. Yes, you have these perfect stories about some leaders. They list victory after victory and nothing else. Every king has a record of his accomplishments which conveniently forgets the defeats. We have many inscriptions of greatness, but who remembers the party that lost. Actually, this is not a phenomenon that we have left behind, even today biographies of great persons are sometimes "cleaned up" because we want our hero to be perfect. But there are also plenty of non-biblical stories of flawed heroes around. Greek and Roman mythology would be nothing without a character flaw. Romulus, founder of Rome, kills his own brother. Odysseus is overly proud. And so on. For that matter Greek and Roman gods are not better, they are angry, jealous, unfaithful and arrogant. Norse gods (Odin, Thor, etc) are a bunch with pretty much the same qualities as their southern counterparts. Iceland’s famous Njál saga is full of people deceiving and killing each other. And these are just a few examples. Stories of perfect beings are just not that interesting. And stories are created to teach a character lesson. We need to see the hero overcome their flaws – or go down because of them. So in itself stories with flawed heroes are not rare. Still, I would say there is a difference between the examples I listed above and the stories about the patriarchs, Moses and the other great Jewish leaders. But what exactly is the difference? And where did he get this from? Well, I found some answers online (R. David Silverberg: Parashat Vayera, from third section on), let’s try to piece it together. Very fascinating stuff! Source is of course the Talmud, where we find many such questions. The underlying assumption is always that the patriarchs kept the whole Torah, including holidays commemorating events that hadn’t happened yet. If you find this disturbing, skip ahead to the next post. In this specific case, the discussion hinges on the meaning of the Hebrew "LaMo’ed ashuv eleicha". The word "mo’ed" could mean "festival". So which festival? The Talmud says Isaac’s birth was on Pesach. There must be enough time between the visit and the "next festival" for pregnancy and birth, so the Talmud discusses two opinions for the visit, Succot (Tractate Rosh Hashanah 11a) and somewhere between Yom Kippur and Succot (Tractate Bava Metzia 86b). This is the widest timeframe possible between two festivals. And – of course – there is another opinion. Chazal (sages from that time whose statements did not necessarily enter into the Talmud) state that the visit was on Pesach and the birth was on Pesach the next year. This is the view Rashi is citing in his comment that we saw above. וַיֹּאמֶר, שׁוֹב אָשׁוּב אֵלֶיךָ כָּעֵת חַיָּה, וְהִנֵּה-בֵן, לְשָׂרָה אִשְׁתֶּךָ; וְשָׂרָה שֹׁמַעַת פֶּתַח הָאֹהֶל, וְהוּא אַחֲרָיו. הֲיִפָּלֵא מֵיְהוָה, דָּבָר; לַמּוֹעֵד אָשׁוּב אֵלֶיךָ, כָּעֵת חַיָּה–וּלְשָׂרָה בֵן. There it is, our "mo’ed". So what does Rashi have to say about this verse? Genesis 17:21 says "But My covenant I will establish with Isaac, whom Sarah will bear to you at this time next year. ", containing "laMo’ed" as well. Only verse 18:10, the one Rashi puts his comment on, does not. Well… he could’ve saved the world from this post by putting the comment somewhere else! Ok, a short summary: Abraham is visited by angels, they tell him that they will come back "laMo’ed" when he will have a son. The word "mo’ed" in Genesis 18:14 may be interpreted as "festival". The sages discuss different festivals, including Pesach. Rashi selects Pesach and this is in turn what Chabad references. To really understand the argument, we’d need to talk about the date of Abraham’s circumsision, the date of the angels’ visit of Lot, the date of Isaac’s birth – but this post is long enough as it is. For a long time, I have been convinced that education is the only power that can truly change the world. And education is also the foundation on which to build a living, thriving Jewish community. Where I live, nearly my complete generation has been lost to Judaism and I attribute a lot of it to missing education. In my community, 90% of my generation came here from the former Soviet Union as children of parents who had no education in Judaism. The communities welcomed the growth, helped the families integrate into their new home country, helped with the paperwork, medical aid, etc. But due to the very small size of the original communities, no time and energy was left for religious education. The children who grew up here have as little attachement and knowledge of the religion as their parents who were forced to abandon it by the communists. The only young people in my community you see at services are converts or people who move here from other countries. This is so sad and I hope we can somehow reclaim at least part of them or their children! After Moses’ death, Joshua ben Nun took over for him and led the 12 tribes into the land of Israel. Starting point is on the east side of the Jordan river (they didn’t really take the shortest route!). 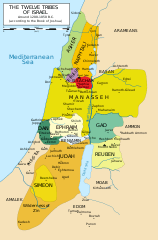 Mainly the book describes how one city/state after the other falls to the Israelites’ conquest (until chapter 12) and when this is done how the land is distributed between the tribes (look it up in a map in the tribal allotments of Israel article on Wikipedia) and the cities of refuge are instated. The book ends with Joshua’s death when he is 110 years old. The spies in Jericho: Isralite spies were hidden by Rahab, a prostitute, and let her and her family live (Joshua 2:1-22, Joshua 6:22-25). Splitting of the Jordan: The waters of the Jordan river stop when the priests enter the water with the ark of the covenant so that all the people can pass (Joshua 3:1-4:24). Destruction of Jerich: The walls of Jericho crumbled when the Israelites blew their trumpets (Joshua 6:1-26). Zelophehad’s daughters get their inheritance: Remember the women fighting for their piece of the land in Numbers/Bamidbar 27:1-11? They also get their share of the land (Joshua 17:3-4). You can read the complete book of Joshua in parallel English and Hebrew at Mechon Mamre or Chabad (with Rashi). I have just finished reading a very interesting series of essays that tries to explain the discrepancies between books Shemot (Exodus) and Bamidbar (Numbers) on the one hand and Devarim (Deuteronomy) on the other hand. The issue is, that Devarim recounts in some places the same stories that have already been told beforehand in Shemot-Bamidbar – but slightly different. In the series Rethinking Orthodoxy and Biblical Criticism, Professor Joshua Berman explains his theory that the Tora follows the form of a treaty between sovereign and vassal kings as was common in the ancient near east at around 1300 BCE. He explains that we find in the Tora many elements typical for such a treaty: a historical prologue, followed by the conditions of the treaty, witnesses, blessings and curses. The repetitions in Devarim would be explained by it being a follow-up treaty, where the elements of the previous treaty are repeated. But they are not repeated verbatim. The conditions may change (read: variations on halachot between Shemot-Bamidbar and Devarim, although the series does not really go into this point). And also the historical prologue is not intended to be a faithful recounting of what actually happened, but a diplomatic instrument, a way of setting the tone of the relationship. It reflects what has happened in the meantime and the differences are not errors, different traditions or anything, they are meant to be analyzed in terms of good/bad diplomatic relations. The first treaty of G-d with the exodus-generation as written down in Shemot-Bamidbar was more positive. The second treaty was with the new generation born in the desert, after lots of things have happened that have influenced the relationship negatively. So the discrepancies we see are all painting Israel in a more critical light. I am no expert in biblical criticism and do not know the alternative theories very well. I do not even know the plain text of the Tora well enough. To me the treaty-theory makes sense. Still, I am left with lots of questions. Where do Bereshit (Genesis) and Vayikra (Levitikus) enter the picture? Is it normal that the "salvation" element, i.e., the story of the exodus, that precedes the historical prologue, is not in the renewal treaty? Why the change of narratological tone between the accounts if both are treaties in the same format? Still, I recommend reading the whole series and I am looking forward to the series on halachot differences between the two parts. "אַתֶּם רְאִיתֶם, אֲשֶׁר עָשִׂיתִי לְמִצְרָיִם; וָאֶשָּׂא אֶתְכֶם עַל-כַּנְפֵי נְשָׁרִים, וָאָבִא אֶתְכֶם אֵלָי." "Ye have seen what I did unto the Egyptians, and how I bore you on eagles’ wings, and brought you unto Myself." "כְּנֶשֶׁר יָעִיר קִנּוֹ, עַל-גּוֹזָלָיו יְרַחֵף; יִפְרֹשׂ כְּנָפָיו יִקָּחֵהוּ, יִשָּׂאֵהוּ עַל-אֶבְרָתוֹ." "As an eagle that stirreth up her nest, hovereth over her young, spreadeth abroad her wings, taketh them, beareth them on her pinions–"
This is truly a very beautiful image and I can definitely relate to the idea that G’d carries us on his wings. But the old sceptic in me asks: Is it true literally? Do eagles really carry their young on their back? Several Jewish and Christian pages have this citation and discuss the theological ramifications (just search for "do eagles carry their young"
Some of these pages, e.g. Zoo Torah (about halfway down the page), bring reported observations of parent birds that let their young rest on their back. There seems to be a discussion about what species exactly "nesher" refers to, an eagle or maybe a vulture or some more general animal category. Zoologist or bird enthusiansts seem to be very sceptic to the claim, e.g. Ask a Scientist. Among other things, young eagles seem to weigh more than their parents, which would it make very hard for the parents to carry them.